The mobile version of our Design Flex® software has arrived! This web application is available for all mobile devices with internet access at www.gates.com/DFMobile. It's fast and easy to design a 2-point drive with multiple synchronous and V-belt solutions that fit your parameters. You can email the solution – as well as the DFPro source file – to yourself or your customer. Need to know proper tension for a known drive? DFMobile can help with that, too! For more information, please go to http://www.gates.com/DFMobile ! 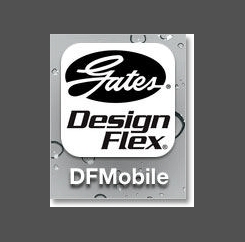 For more information, please go to http://www.gates.com/DFMobile !